Over the next few weeks I will recap the 2012 season of each affiliate. This week will focus on the overall season, next week will cover the hitting leaders and the final week will be pitching leaders. Like the week in reviews earlier in the season, each day will bring attention to a different affiliate as we work our way through the franchise. 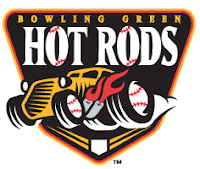 Today we take a look at the overall team stats of the Bowling Green Hot Rods. The Hot Rods won the second half title and made the Midwest League playoffs for the second straight year. Although they were eliminated in the first round, the Hot Rods finished strong with a franchise best overall record of 80-60. The Hot Rods also placed a franchise high eight players in the Midwest League All-Star team with Ryan Brett, Jake Floethe, Jeff Malm, Tyler Goeddel, Jake Partridge, Matt Rice, Felipe Rivero and Josh Sale making the trip to All-Star Game. But their success was overshadowed by having four players suspended for violating the MLB drug policy. Great Coaching staff for the Hot Rods. Thank you, all of you!